This November will see some very interesting changes in our country. And while I keep this blog from being political in any way (unless we're talking about bests and worsts in makeup, of course) ... voting is important! We really can -- and should -- influence the outcome of what will happen for our country. And what better way to head to the polls than with Stila Rock the Vote Red Lipstick? 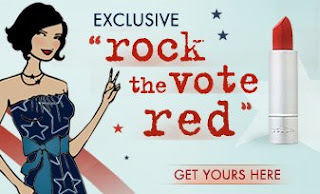 Stila has teamed up with Rock the Vote to create a totally rockin' red hue that should inspire all of us to get out there and vote. Even better, a percentage of sales from each $17 tube will go toward Rock the Vote! To get yours, head to Stila's website. We can make a difference!